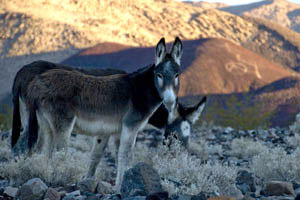 Bugs were bad this last weekend, but the burros were worse. I've never seen them swarm, too! The rumored feeding has apparently emboldened them. I always thought it was cool to hear them walk through at night, and occasionally see them during the day, and hear a couple brays at night. But last Thursday night at Palm Springs was out of control. Breeding season, maybe? If there's no more precip, North pass should be almost all dried up. I see some forecasts indicating some storms the last week of March though. We're planning to visit the springs on the dates above, driving in on Sunday the 2nd and leaving on Wednesday, the 5th. We'll take the North Pass if the mud is dried up a bit, otherwise coming via the South Pass if North sounds too difficult for our AWD RAV4. Anyone else planning a trip around that time? Anyone want to caravan in? How are the bugs lately?